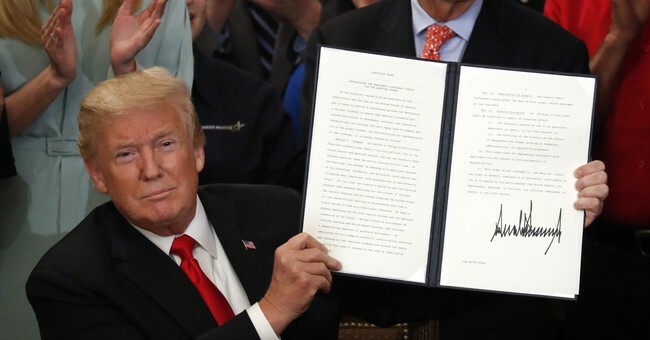 President Donald Trump signed an executive order Thursday afternoon from the Oval Office protecting First Amendment rights on campus and condemning discrimination against conservative speech. "We reject oppressive speech codes, censorship, political correctness, and every other attempt by the hard left to stop people from challenging ridiculous and dangerous ideas. These ideas are dangerous. Instead, we believe in free speech, including online and including on campus," Trump released in a statement. The executive order allows federal government agencies to withhold grant funding from universities engaged in stifling free speech or discriminating against speech administrators politically oppose. "Agencies will take appropriate steps to ensure that college and university campuses are places of free thought and debate. The Trump Administration believes that public schools should fulfill their obligation to uphold the First Amendment and private schools should comply with their stated institutional policies regarding free speech," the White House released. "The Trump Administration believes that schools should promote free speech and be transparent about their speech policies." President Trump previewed the executive order during a speech at the Conservative Political Action Committee last month. The White House invited a number of students from Young America's Foundation [YAF], Campus Reform, Turning Point USA, The Leadership Institute and other organizations to attend the signing. For years YAF has issued lawsuits against universities for infringing on the free speech rights of students. The Left should be the MOST supportive of Trump's Executive Order on Free Speech. The executive order also addresses issues of overwhelming student loan debt and giving students clearer ways to make decisions about higher education.